It’s hard to reason with a kidnapper. This was one of the most intense things I’ve read in a long time. I actually ended up devouring the whole thing in less than two days because of how eager I was to see what would happen next. The only thing scarier to me than being abducted would be if my abductor was someone I loved and trusted. Emma’s reaction to her new prison kept me perched on the edge of my seat from the first scene to the last one. I would have liked to see more time spent developing the ending. The pacing in the beginning and the middle was excellent, but it suddenly sped up in the last few scenes. I went from breathlessly wondering what would happen next to feeling shocked that it was suddenly finished because of how quickly everything was paced. It would have been interesting to see how those scenes worked in a longer novella. There seemed to be enough material in the plot to warrant a longer storyline, and having that extra time would have made the end feel less abrupt to me. Emma was so brave. I liked seeing how she reacted to her impossible circumstances, especially once she started to put the pieces together and figure out what was happening in her life. She was also such an easy main character to relate to because of how freely she shared her ideas with the audience. 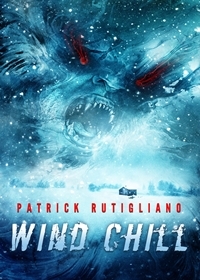 Several other horror stories were included after Wind Chill ended. They surprised me because I didn’t realize this was an anthology when I originally requested it. It’s hard to say much else about this bonus content without giving away major spoilers due to how short each tale was. I definitely do suggest checking them out, though, as they were all well written and pretty scary. Wind Chill made me shudder at the thought of being alone in a cabin in the woods in the middle of winter. I’d recommend it to anyone who has ever listened to the wind beat against their windows and shivered at the idea that there might be something other than a storm raging outside.